We are a small family business who have been making quality craft items for over 10 years. 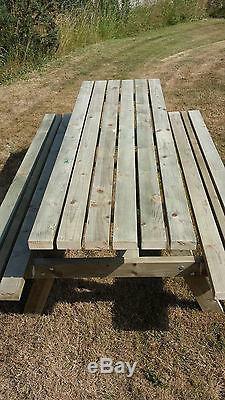 Hand built 7ft Deluxe Heavy duty picnic bench constructed from selected slow grown C24 Strength graded pressure treated Timber. 194cm(L) x 137cm(W) x 79cm(H). Our Deluxe bench offers the standard table top with wider seats for extra comfort. HEAVY DUTY TIMBER 100 X 50 mm nominal approx 97mm x 46mm finished. As you can see in picture 1 (6ft bench) our benches are very strong. We are almost ashamed to say it is holding half a tonne! STRENGTH GRADED PRESSURE TREATED TIMBER FROM SUSTAINABLE FORESTS FOR LONGER LIFE. ALL PLATED BOLTS WITH NYLON LOCKING NUTS (Aircraft Nuts). PLATED SCREWS (no nails used). QUICK AND EASY ASSEMBLY WITH SIMPLE INSTRUCTIONS AND VERY FEW PARTS. WIDER SEATS FOR EXTRA COMFORT. NATURAL FINISH TO MATCH DECKING. UNLESS REQUESTED BENCHES COME WITHOUT A HOLE FOR PARASOL. ALL BENCHES ARE BUILT TO ORDER AT OUR WORKSHOP AND CAN BE CUSTOMISED TO YOUR EXACT REQUIREMENTS. In the event of a nuclear strike we will sit under the bench cool job. Best table you will ever see! Delivered on time top ebayer. CARLSBERG DONT DO PICNIC BENCHES BUT IF THEY DID..
TOP CLASS SERVICE I CAN NOW SIT IN THE RAIN THANK YOU AAAA ++++. Really excellent product and customer service from a great family run business. EXCELLENT THATS ALL I CAN SAY. WE CAN ACCEPT CREDIT OR DEBIT CARD PAYMENTS BY TELEPHONE PLEASE CALL 01745 822344. 3-8 BENCHES TO UK MAINLAND O/S. 2-8 BENCHES TO IRELAND O/S. 2mtr Green with white trim with steel tilt pole (painted green). CAN BE COLLECTED FROM NORTH WALES OR WE WILL DELIVER OR ARRANGE YOUR OWN COURIER COLLECTION. 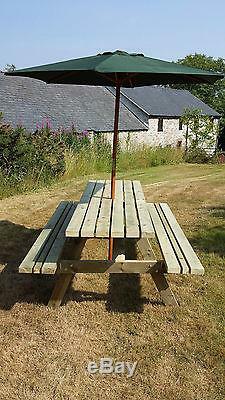 The item "7FT PICNIC BENCH HEAVY DUTY WIDE SEAT GARDEN TABLE" is in sale since Saturday, July 20, 2013. This item is in the category "Garden & Patio\Garden & Patio Furniture\Garden Chairs, Swings & Benches". The seller is "woodker2005" and is located in North Wales. This item can be shipped to United Kingdom.